TOKYO, Japan (CNN) -- Japan's Prime Minister Taro Aso announced a historic ¥15 trillion ($150 billion) stimulus package Friday aimed to turn around the recession in the world's second largest economy. Japan's Prime Minister Taro Aso has announced a $150 billion stimulus package. Steeped in a recession, with a surge in bankruptcies and sentiment among its largest manufacturers at a record low, Japan has seen unemployment reach a three-year high. The stimulus plan is meant to keep Japan's economy from cracking open, coalition party officials told CNN. It is the biggest-ever supplemental budget to boost the ailing economy. Japan has been hit hard by the global financial slump. Although Japanese banks were spared the brunt of the credit crisis, the drop in exports to the United States has sent the country into its worst recession since World War II. 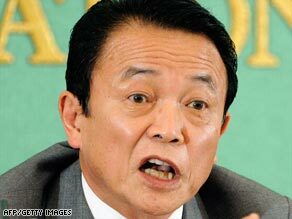 Aso needs the package to boost Japan's economy and his government's popularity. "This could help save his life as prime minister," said Satoru Ogasawara, a Tokyo-based economist for Credit Suisse. The Aso administration's approval rating fell below 10 percent two months ago, but has been buoyed by the stimulus package and the recent North Korea rocket launch, Ogasawara said. If approved, the package could add two points to the country's gross domestic product, Ogasawara said. But its long-term impact remains an open question. "It will help the economy from collapsing from this point ... [but] unless the package improves productivity or increases demand, it will be a short-term fix," Ogasawara said. Jesper Koll, president and chief executive of TRJ Tantallon Research Japan, said the stimulus package was unlike the ¥12 trillion injections into the economy in the past eight months. "This is the first designed with real business input, and that's reflected in the package," he said, referring to a series of meetings Aso held with business leaders last month. "That's outside the normal technocratic, bureaucratic fix. ... It isn't just pork-barrel money for the boys." Koll cites details of the plan -- such as tax breaks for gift-giving, environmentally friendly cars, or measures to increase employment in health care -- as a step forward. "This goes way beyond grand-standing fiscal policy. It's very specific. For Japan, that's something," he said. Still, Japan now has one of the highest amounts of public debt in the world - a rate which could approach 200 percent of GDP next year, according to the Organization for Economic Cooperation and Development. "The government has since spent billions and billions of dollars to support the economy," Kirby Daley, a strategist for brokerage Newedge, said. "Japan has been trying this and has now gone into almost two lost decades and will likely enter a third lost decade if they continue down this policy path. It has not worked in Japan. It will not work again." -- ¥1.9 trillion for unemployment benefits and the promotion of job sharing. -- ¥3 trillion to boost struggling companies. -- ¥1.6 trillion to promote green initiatives, such as the purchase of environmentally friendly cars and energy-efficient electronics. -- ¥2.6 trillion for infrastructure, such as airport runways, train networks and road extensions. -- ¥1.7 trillion for health and welfare. The proposed stimulus package helped a rally in Japanese stocks this week, with the Nikkei 225 Average briefly breaking the 9000-point level for the first time in three months on Friday morning trading. The Nikkei hit a 26-year record low last month.